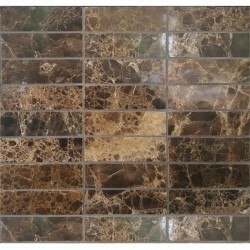 Emperador Mosaic There are 3 products. Chip Size: 100x32x7 mm Sheet Size: 297x285 mm Price per sheet Sale price is available for limited stock only. Chip Size: 23x23x7 mm Sheet Size: 300x300 mm Prices are per sheet Sale price is available for limited stock only.